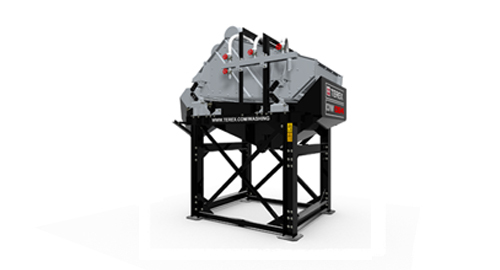 Terex Washing Systems offer a range of dewatering screens. Their rugged construction is designed to combat a range of applications. Whilst primarily applied for dewatering with retained fines they are capable of being used in a wide range of applications. The screen incorporates a 45° sloping back deck section, fitted with slotted apertures across the direction of flow. The main deck of the screen slopes upwards at 5° vibration is produced by two exciter motors operating at 980rpm.